- The Papillon - Also known as the Continental Toy Spaniel, Pap, Phalene and Epagneul Nain Continental. This friendly and graceful little dog is recognised to be a Franco-Belgian dog breed, due to the shape of it's ears it is also known as the Butterfly Dog (Papillon is French for Butterfly). The Butterfly Dog is a small dog and is part of the Toy Dogs Group, these dogs in the 16th and 17th centuries were known as Dwarf Spaniels which used to only have large drooping ears, in fact there are two different breeds, one with drop ears and another with erect ears in which the name Butterfly Dog originated. This charming little dog has been around for more than 700 years in which makes it one of the oldest dog breeds still to be among us today and is still very popular and quite a heart-stealer, intelligent, very obedient and can be trained easily. Although being very lively and playful making a good companion this dog wouldn't be recommended for young children, these dogs are hardy and smart and it isn't often known that they have great athletic abilities, great dogs to have if you live in the city because they are quick learners and easy to train. 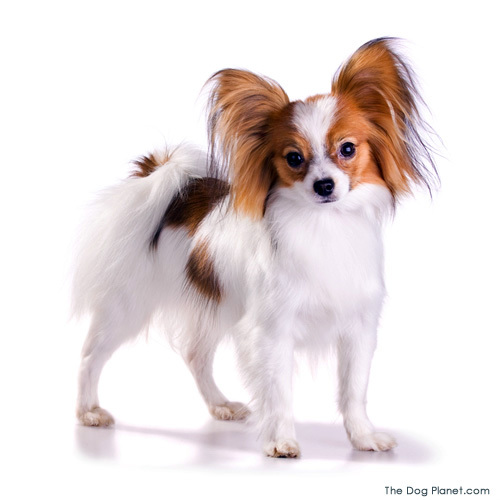 Click here to know even more about the Papillon Dog Breed.